Lock in a great price for Serenity Lodges Dominica – rated 9 by recent guests! The hotel is located in a very quiet place and has good views of the mountains. Lester and Corina always greeted us with a brilliant smile. Lestor, Carina and Sienna - the family that runs this guest house and the beauty of the location and the value for the money makes this a special place to wake up at. Amazing location with excellent views. The place si very clean and the hosts are very friendly. This is a perfect stop on the West coast of Dominica -- a real oasis of tranquility. The food was served on a covered deck and was delicious. The host helped me to retrieve my "lost" luggage by taking me to the airport at no charge. The area is very rural and as the accommodation is up on the side of the ridge it was absolutely quiet and peaceful day and night. Very clean and nice place. Comfortable bed, nice view and very friendly owners. A real place of serenity. We highly recommend!! Carina was a great host and took us on an interesting island tour during our stay. The place is a short drive from the airport. Pleasant views over the valley. The rooms we fairly basic but fine for a few days stay and at the price. Enjoyable area for walking although very hilly. Good breakfast. We were also allowed to check in early and check out late (needed due to the timing of our flights) for no extra charge. Dominica is still very much in the recovery stage after the hurricane in 2017 but is open for business and needs more visitors. 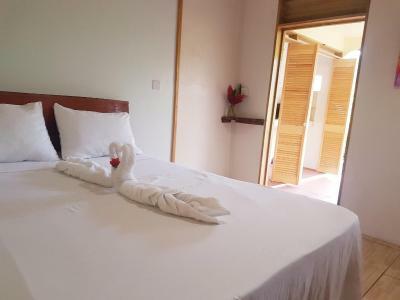 You won't go wrong with a stay at Serenity Lodges. I wish we had been able to spend a few more days there. Lovely family run lodges with stunning views over the valley. Carina and her husband made our stay unforgettable and we already plan to go back. 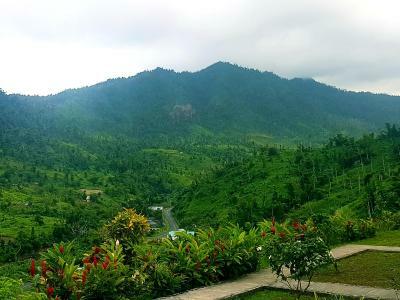 Serenity Lodges Dominica This rating is a reflection of how the property compares to the industry standard when it comes to price, facilities and services available. It's based on a self-evaluation by the property. Use this rating to help choose your stay! 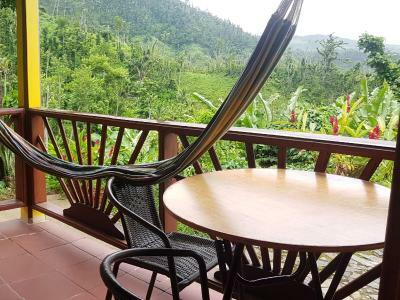 Guests can take in views of the tropical gardens and surrounding mountains from the guest rooms at Serenity Lodges Dominica. 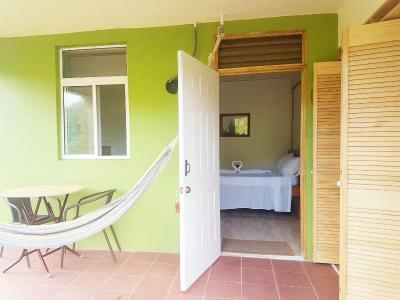 Rooms have a veranda or balcony with a hammock. The mountain-view restaurant features a vegetable garden and offers delicious local cuisine cooked with fresh herbs. 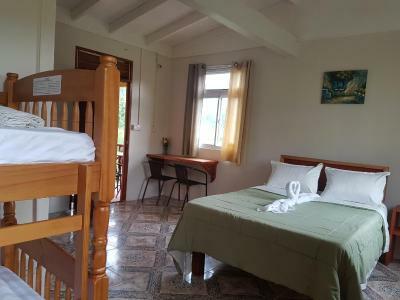 The guest house has multilingual staff who can arrange taxi transfers to the airport and ferry in Roseau. 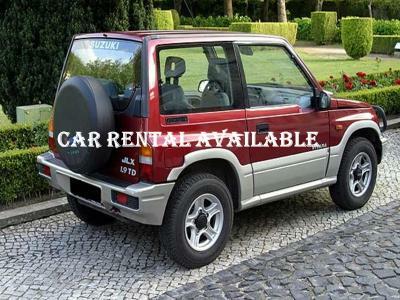 Car rental is also available. Marigot village center is 7 minutes’ drive from the Dominica Serenity Lodges Guest house, and there are shops within walking distance. This property also has one of the top-rated locations in Marigot! Guests are happier about it compared to other properties in the area. 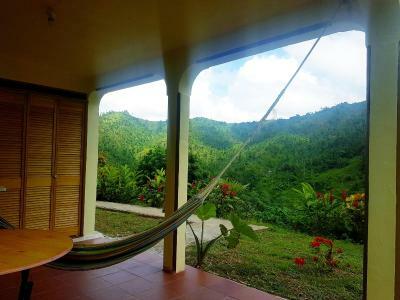 This property is also rated for the best value in Marigot! Guests are getting more for their money when compared to other properties in this city. When would you like to stay at Serenity Lodges Dominica? 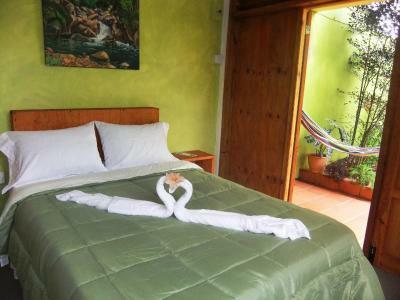 This spacious room has a veranda or balcony with a hammock and beautiful views of the gardens and mountains. It offers a private bathroom with a hot shower. This room features either a balcony or terrace boasting a hammock and overlooking the mountain side and the garden. The private full bathroom has a hot-water shower. House Rules Serenity Lodges Dominica takes special requests – add in the next step! Serenity Lodges Dominica accepts these cards and reserves the right to temporarily hold an amount prior to arrival. Please be informed that the restaurant is closed on Tuesday evenings. Please take into account that meals are prepared upon advanced request. If there are any diet restrictions, please let us know. Please inform Serenity Lodges Dominica of your expected arrival time in advance. You can use the Special Requests box when booking, or contact the property directly using the contact details in your confirmation. The room was very basic - not that we expected much at this price but still it was basic. The room was not cleaned during our 2 day stay and there was not enough hot water available. The breakfast and dinner were overpriced considering the small portions. The owners did not give us any recommendations about where to go or what to do. Also they did not tell us that paying by credit card would incur a 3% fee. Had we been informed we would have got the cash out and saved a few dollars. Really nice Lady, great food and a hammock! There are a limited number of food options nearby and none within reasonable walking distance but Carina did give us a lift to and from a pleasant restaurant a short drive away. Friendly and helpful. View was beautiful. Hammock was wonderful. Owners were amazing. The bed was not the most comfortable, but the hammock is a really nice feature -- you can relax and enjoy the views in complete silence. The hosts at Serenity Lodges were extremely kind and helpful. The communication was excellent from the beginning til the end. I enjoyed my stay very much and would definitely recommend the place and come back myself!